The basic idea behind landscaping a yard is to create an attractive setting for your house and secondly to create a living space for you and your family. The house that is presented by this front yard has to be low maintenance as the owner is alone and prefers not to spend her time mowing grass. The solution is excellent with washed stones as the base and some surrounding trees she has a front yard that sets off her house nicely. 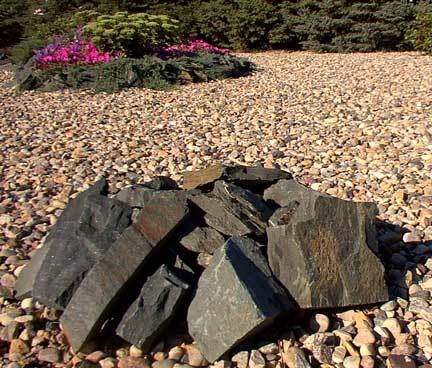 Many years ago she and her late husband collected from Northern Ontario besalt rock seen here (right) and it seemed fitting to make use of this material in a planter to feature on the yard and a few piles of these rocks to present a nice colour contrast to the gravel and stark white driveway. It matters not what we call the feature element in a yard, some refer to this setting as a flower bed while others are referred to as planters, but in essence, the arrangement is to break up the visual experience and present some contrast that is both interesting and adds some colour. 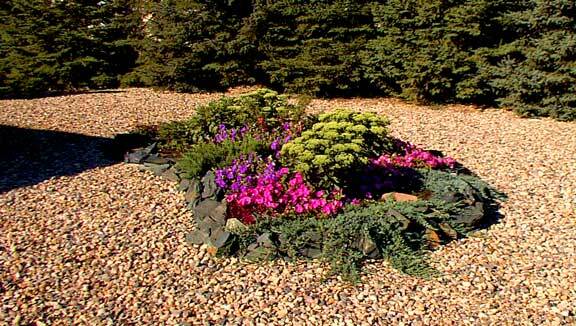 In this case there are some perennial shrubs and some annuals have been included but in both cases the height and colour of the arrangement is attractive and fits in well with the gravel/stone lawn. This page is a story posted on Ensign and/or Saskatchewan News, both of which are daily web sites offering a variety of material from scenic images, political commentary, information and news. These publications are the work of Faster Than Light Communications . If you would like to comment on this story or you wish to contact the editor of these sites please send us email.